I think every girl needs a chandelier in her closet. It just makes it more fun to get ready in the morning, for me anyways. It adds some glamour for not a lot of money. Before we had just a regular builder's grade flourescent light in the closet. These get the job done, but don't do a whole lot aesthetically. I really thought I took a "before" picture of this chandelier but I cannot seem to find it anywhere so I'm just going to show you one that is similar to it so you can get an idea of what it looked like. It was actually in a little worse shape than this one. I found it for $5 at Goodwill, a deal that was too good to pass up! I primed it and sprayed it black and now it makes my closet look totally different! Please ignore the holes in the ceiling that need to be patched from the previous light, I just couldn't wait to show you. I'm thinking about maybe adding some small shades to it in a fun pattern. I like the light but love the shoes! I can't wear heals and am envious of those who can! 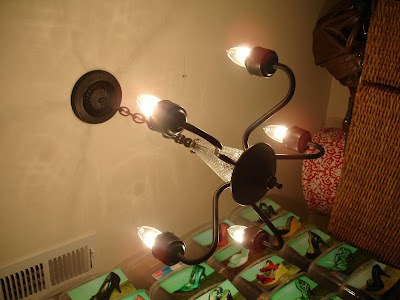 Hey I think that the glass on that light looks alot like the 2 glass globes you found at Goodwill and made the lamps for your bedroom! 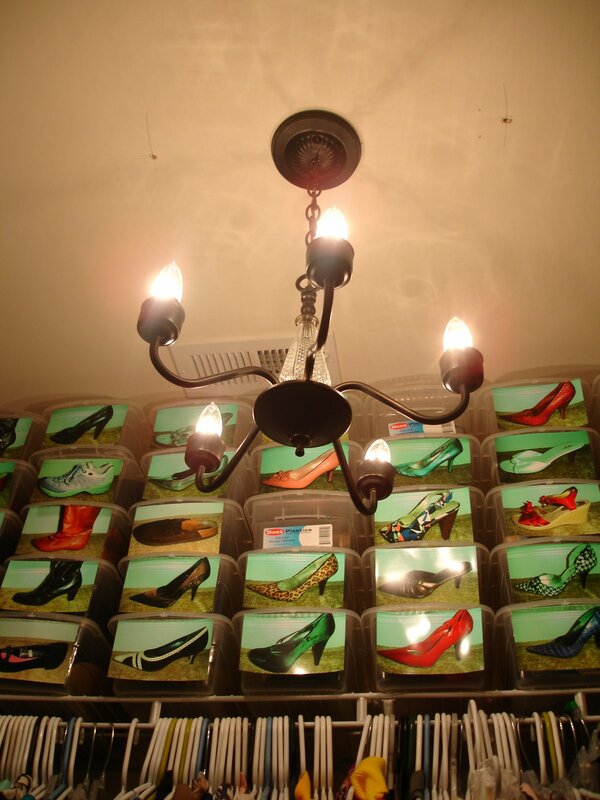 Love the closet chandelier and yes I too am very jealous of all your marvelous shoes and how adorable they always look on you! Love the chandelier! 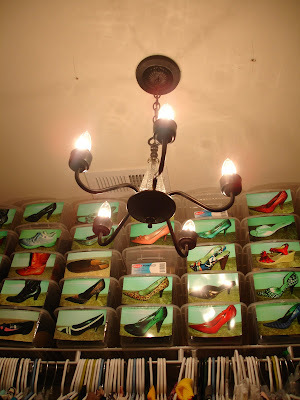 I would LOVE to have you link up your original shoe box post on my SHOESday link party. Such a brilliant idea. I used a little tiny polaroid years ago for my shoe boxes. This is so much better. Drop by and join if you'd like. 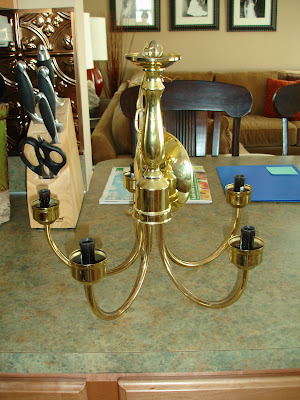 We just bought a house and the kitchen chandelier looks nearly identical to the "before" picture in this post. 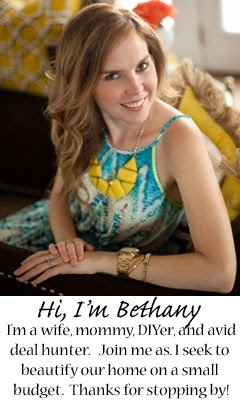 I was thinking of spray painting it--but I'm horribly 'non-crafty'...but your site has inspired me! How do I go about priming and painting it? Do you prefer certain brands over others?? Let me know, if you can! Thanks! thank you! LaRae, I prefer Kilz spray primer and for spraypaint I like Valspar (Lowe's brand) and Rustoleum. You can use whatever you like though. 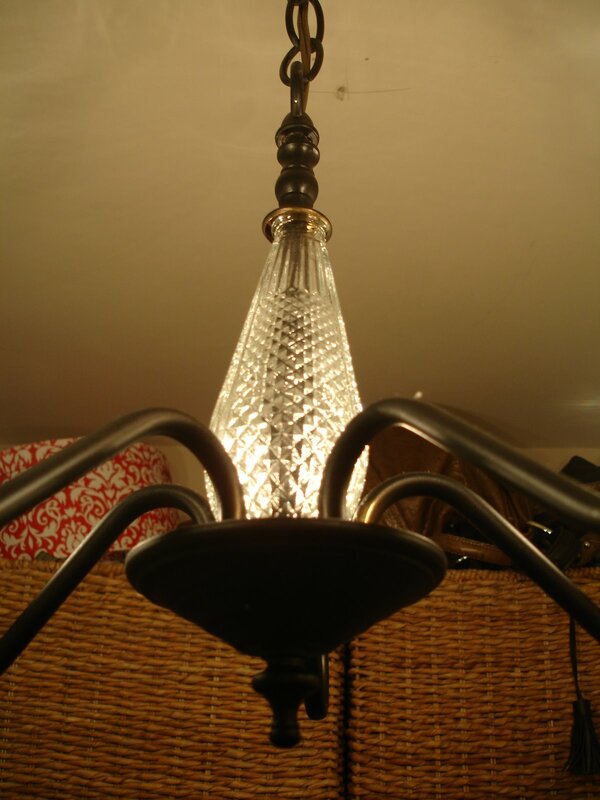 Rustoleum has a nice oil rubbed bronze paint that I think would look really pretty on a chandelier! I would love to see a pic when you get done, I'm sure it will turn out great!